I’m walking through a field of basketflowers — robust, pale stalks that grow to my waist, evidence of a flush season long past, but now they’re brittle as straw. A few mesquite bushes green up an otherwise pale sea of grasses. Pocket gopher mounds pock the reddish brown earth and tumbleweeds blow periodically across the roadside as if a tumbleweed factory churned them out, just beyond sight. In the midst of this quintessentially Texan landscape typical of the panhandle plains, a massive gash of a canyon slashes its way across the land — 120 miles long, 6 to 20 miles wide, and 800 feet deep. Carved by the Prairie Dog Town Fork of the Red River, the ruggedly beautiful Palo Duro Canyon arises where it seems it shouldn’t. Its striated rock layers tell history as the Grand Canyon does — covering four major geological periods spanning more than 240 million years. The canyon forms part of the eastern edge of the Llano Estacado, the largest plateau in the United States, which stretches westward into New Mexico. Water has worn caves, pillars, hoodoos, buttes and mesas in the rock, creating an enticing landscape for exploration. But the rocky escarpment and cliff ledges also create ideal habitat for one of Texas’ lesser known but most endearing species — the agile, rock-face-loving ringtail. My two kids and I have joined up with Naima Montacer, a graduate student at West Texas A&M University who has spent the last two years studying ringtails in the 26,275-acre Palo Duro Canyon State Park, and her advisor, biology professor Ray Matlack. We’re here to live trap ringtails, as well as other mesocarnivores — or mid-sized carnivores — including gray foxes and raccoons. People sometimes call ringtails civet cats because their musky secretion resembles musk produced by African civet cats. But the most memorable name is cacomistle, an Anglicized version of the Hahuatl Indian word tlacomiztli meaning “half mountain lion.” They range through the desert southwest through Mexico, as well as in California, Oregon and Wyoming and parts of northern Mexico. They inhabit most of Texas, more commonly in their preferred rocky habitats. 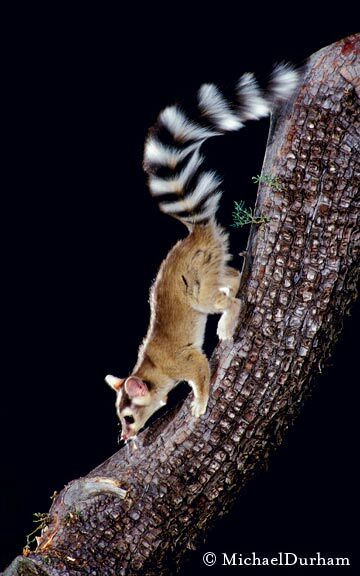 Ringtails live mostly solitary lives, except during mating season, which occurs from February through May. Females give birth to one to four fuzzy offspring just less than two months later. Newborns have stubby tails, only later growing the characteristic long striped tail. After the mother weans the offspring around ten weeks, the male helps by bringing food for the young, including insects, lizards, small mammals and birds. Ringtails ambush their prey and kill them with a bite to the neck. Depending on the season, ringtails also sometimes eat fruits, seeds, berries and even nectar. And after a hard night of foraging, they sleep with their long tails curled up around their bodies. Montacer started her research trying to determine whether or not they lived at Palo Duro Canyon at all, since the author of The Mammals of the Llano Estacado wrote that despite seemingly ideal habitat, ringtails were not found along the Llano Estacado escarpment, including Palo Duro Canyon. Despite that, rumors and anecdotes of ringtails occurring in the area persisted. Montacer’s research has answered that question. Since she began trapping in the summer of 2006, she’s caught 23 different individual ringtails. The first time she caught one she was alone. After toying around with various baits to figure out just what would attract them, from eggs to chicken to Jell-o and molasses, she settled on the perfect combination of sardines, apples and honey. “When she got back to the lab, she had a huge grin on her face,” says Matlack. “I knew she’d caught one.” Before long, she had trapped multiple ringtails and placed radio collars on them, which allow her to track just where the animals spend their time and which habitat they use most. Montacer used Geographic Information Systems (GIS) mapping to identify four different habitat types within the park: rocky escarpment, parkland mesquite savannah, riparian, and mixed brush woodland. We first check traps in parkland savannah, which has tall grasses, scattered mesquite and fields of basketflowers. The wire mesh “Tomahawk” traps are about the size of a large toaster oven. Six traps are set in each of the four habitats, and so after checking all six — no ringtails, no skunks, no animals — and rebaiting with new sardines, apples and honey, we move on to the brush woodland, which has heavy mesquite and juniper cover. We drive between different regions, because after all, it is the second largest state park in Texas. Once again, the traps remain empty. Next, we head out to the beautiful canyon ledges, or escarpment. “The escarpment is the only habitat where I’ve ever caught ringtails,” Montacer tells me. I hope we will have some luck. It’s also the only habitat where she’s caught gray foxes and one species that wreaks havoc on native birds — feral housecats. During summer and fall of 2006, Montacer followed 10 ringtails around the park using radio telemetry, which works kind of like a technical version of the children’s game “hot /cold.” The scientists place a radio collar with a unique frequency around the animal’s neck. Over the next days and months, Montacer used a radio telemetry antenna, set with the same frequency, to locate the ringtail. The antenna beeps more loudly as it gets warm, warmer, hot, hot hot! The scientist then follows the strengthening signal until it’s beeping so loudly that you know you’re close. At least in theory. Following the agile creatures by radio telemetry meant climbing way down into the canyon along steep precipices, which was intense and challenging at night. “Ringtails jump down deep into dens in the canyon, causing you to be able to hear the signal very strong one minute, and the next, it would be gone,” says Montacer. She and Matlack and helpers spent hours following ringtails at night, which is when ringtails forage. “They are fast and very agile and inhabit cliff faces in the canyon which they dive in and out of.” Their thin bodies allow them to climb inside crevices to hide, and their feet — which can rotate 180 degrees — enable them to cling to precarious cliff ledges. They’ve been known to “stem” or place two feet on one wall and two feet on another to climb up or down a narrow crack in the rock face. I climb down with Montacer to a cliff edge where she had set one of the traps. The morning sun rising over the canyon adds depth to the reds, rusts, pinks and grays of its rock layers. The trap is closed, and I start to get my hopes up. But, alas, although the bait is gone, the trap remains empty. We check the remaining five traps but, again, nothing caught. Montacer tells me she just caught several ringtails in a different area of the park last week. A full moon last night may have reduced the activity of the ringtails these few days. Small mammals — and anything that may get preyed on — forage less, or more carefully, when the light of a full moon exposes them more readily. Another study looked at ringtail ecology in West Texas not long ago. Between 1999 and 2001, Sul Ross State University graduate student Elizabeth Ackerman, along with her advisor, professor Louis Harveson, captured several ringtails at Elephant Mountain Wildlife Management Area in the Chihuahuan Desert. Like Montacer, they found that ringtails prefer the rocky escarpment habitat and that they denned exclusively in the rocks, strongly preferring 30 to 60 percent slopes for their dens. Studies from other areas show ringtails also using trees and brush piles for dens. We head to the last habitat, riparian, which runs along the Prairie Dog Town Fork of the Red River and its tributaries, a green, lush area, with rustling cottonwoods lining the creek banks. Getting to the traps requires either jumping over a stream that seems far too wide to jump over — though Montacer does it easily — or wading through. I wait on the other side of the stream until I hear that they’ve caught a raccoon. I go for the wading option, carrying my daughter piggyback, while Sam wades across himself. The raccoon barks and growls, obviously none too happy about its situation. Matlack and Montacer position the trap so that they can inject the raccoon with Telazol to put it to sleep so they can weigh it and ear tag it for identification. Before long the raccoon falls asleep, and the two get to work while we watch. Montacer tells me that she has found that raccoons tend to be found more frequently in the riparian habitat. My daughter gets to hold the sleeping raccoon, but as it starts to move, we realize it’s wise to set it down and move on.